Add wearable luxury to your wardrobe with the purest Peruvian Pima, renowned as the world's softest and most durable cotton, this shirt's subtle luster and superb construction puts it on par with the nation's top retail brands. Available in Men's and Ladies' sizes in up to 29 colors. See #AD100 for Men's and #AD100W for the Ladies' Y-Collar sizes. Men's & Ladies' AD100, AD100W & AD112W can be combined for higher quantity pricing. 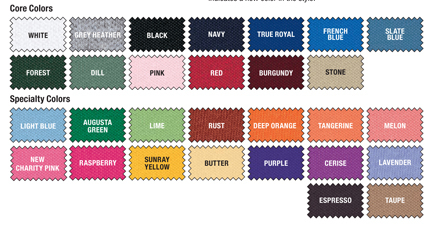 There is a $3.00 surcharge for each polo shirt ordered in size 2X or 3X. Please add the qty of 2X and 3X polo you are ordering below.